When it comes to customer relationship management software there are numerous services out there, but the field has two giants: Salesforce and Microsoft. Salesforce is certainly the popular CRM software option, used by thousands of businesses worldwide. Microsoft Dynamics, meanwhile, is a great choice for those whose businesses are already integrated with other Microsoft services, such as Outlook and Office 365. 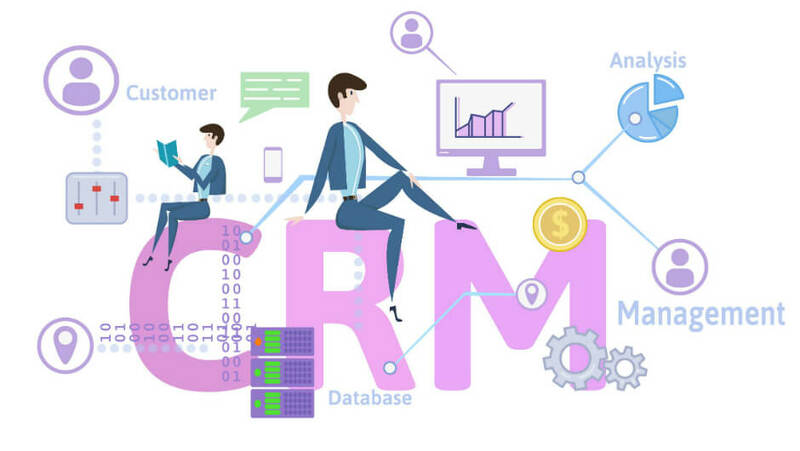 Microsoft’s service is known as Dynamics CRM and, like Salesforce, offers a ton of other complementary services that expand the basic CRM and go all the way up to enterprise resource planning (ERP) applications. Both Dynamics and Salesforce are aiming to be an all-in-one solution to serve your office’s needs. Deciding on which one to use comes down to personal taste, and which one fits your company’s needs. A CRM platform isn’t just about the service’s various attributes, but which one fits best with your company. Let’s take a look at the strengths of both services to get a better handle on the two CRM giants. Our advice is to click on the Get Quote button included here to get a CRM quote that will take into account your industry, company size, your CRM use case, and other factors to help determine the fit that’s right for you from numerous services. Salesforce or Microsoft Dynamics – Which CRM System Should You Choose? Microsoft Dynamics and Salesforce are reputable CRM brands from two of the biggest names in global software. While Microsoft is well-known for its consumer and business software – including the ubiquitous Windows and Office platforms – Salesforce is more of a CRM purist. Indeed, Salesforce is almost a byword for CRM software, it’s become so well-established in the field. But, that’s not to say Microsoft is an also-ran. In fact, one of the strongest things going in Microsoft Dynamics’ favor is how well this platform can integrate with other Microsoft software. Chances are, your business is already running plenty of other Microsoft tools, so adding Dynamics may be a smart choice. Let’s look in a little more depth at the pros and cons of each of these big name CRM providers. The first thing to know about Microsoft Dynamics is that it is heavily integrated into other Microsoft applications. Microsoft’s integration doesn’t just extend to its desktop software, either. Even LinkedIn, which Microsoft acquired in 2016, integrates with Dynamics CRM. The platform uses design language similar to other Microsoft software, making it easier for anyone who’s already familiar with the look and feel of modern Microsoft applications to feel right at home. Most of the various Microsoft Dynamics services use a dashboard as their starting point similar to Salesforce. Here, you get at-a-glance information about the current state of your business. In Dyamics CRM for Sales, for example, the dashboard supplies current sales revenue, the average deal size, and your sales force’s lead conversion rate. Dashboards are completely customizable and usually take the form of a tiled interface with large lettering for key numerical data, as well as large charts and graphs. The primary starting point for many is Microsoft Dynamics for Sales. This core CRM app uses predictive analytics to better enhance the sales team’s snapshot data and help make better decisions. This is also where Microsoft’s LinkedIn integration comes into play; the LinkedIn Sales Navigator (available at higher pricing tiers) leverages your professional network to get introductions to potential leads through a mutual connection. Beyond sales there’s a customer service module that can present key data such as open cases and email history as a dashboard or you can drill deeper with a timeline of interactions. Dynamics also uses a guided three-step process (identify-research-resolve) for dealing with customer services issues. Harnessing Microsoft’s server power, Dynamics offers intelligent chatbots that can help customer service agents surface important data about their customers. For companies that need it there are also project and field service modules to help manage ongoing services delivered to a client, as well as those times your company needs to send a technician into the field. Microsoft offers some helpful, smart automation, and a big emphasis on graphics to help absorb information rapidly. The big deal with Dynamics CRM is its easy integration with other Microsoft software. This is something Salesforce simply can’t compete with and should be a big consideration for any business already using a variety of Microsoft services. Take Outlook 365 webmail, for example. The Dynamics Sales module has a feature called Microsoft Relationship Sales that can automatically pull information from Dynamics into Outlook. On top of that, the same feature can pull in LinkedIn data to give you a better understanding of potential and current clients. Dynamics offers on premise or self-hosted options for its software whereas Salesforce is an entirely cloud-hosted service. Widely known as one of the best CRM systems around, Salesforce has much cause for confidence. The company insists, for example, that Salesforce can outdo its main competitors. In truth, the functions of Salesforce and Microsoft Dynamics are broadly similar. Where Dynamics has its modules, Salesforce has its various “clouds”, such as Sales Cloud and Service Cloud. These two form the major components of its CRM solution. Sales Cloud offers all the essential features you need for CRM, such as managing opportunities, leads, contacts, accounts, and email integration (Gmail and Outlook). Alternatively, users can access Salesforce data from within Gmail. This is similar to Microsoft’s Relationship with Sales feature we discussed earlier. Service Cloud also offers a number of essential features such as the ability to chat with customers across multiple platforms including IM, social media, and SMS. There’s also an integrated field service option and the ability to see all communication with particular customers. What really sets Salesforce apart, however, is its intuitive Lightning interface, which uses a mix of tabs, lists, and customizable dashboards with tiled components, similar to Dynamics, offering at-a-glance data. 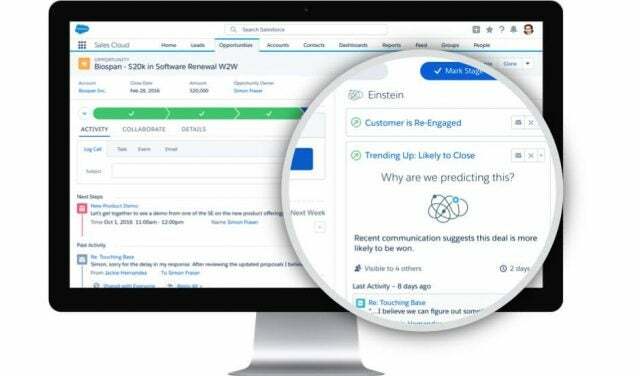 Salesforce also has its Einstein analytics for automated insights into the business, and Chatter is an internal social network where employees can post information publicly to the rest of the team to keep the communication lines open. CRM software doesn’t always come cheap, and that’s definitely true with Microsoft Dynamics where prices start around $80 per user per month for a subscription to the Sales module and go up to $115 per user per month for modules such as Customer Service or Field Service. Salesforce, meanwhile, starts much lower at $25 per user per month for up to five users on either Sales Cloud or Service Cloud. Remember, pricing can change depending on your needs. The best way to find the right fit is to get a customized price by clicking our simple Quotes Form at the bottom of the page. Let’s be clear – neither CRM tool would be a bad choice for your business, and both are market leading CRM suppliers. As for which is best? That really comes down to what your particular needs are, and what your existing setup looks like. If you are already working within a dedicated Microsoft infrastructure, then take a hard look at Dynamics CRM to see if the integration with other Microsoft services will be useful to you. For smaller, price-sensitive companies, however, Salesforce is probably the better option since the starting cost is a lot lower especially for CRM-only teams of 5 or less. The downside with the cheaper Salesforce options is that you cannot customize them to the same extent as the the higher priced tiers. Both services offer mobile apps for employees on the go, but based on app reviews Salesforce has the clear lead there. As we said earlier the key to deciding on a CRM is finding a service that fits your needs in terms of functionality, price, and customizability. For that you really need a bespoke quote that takes all of those factors into account. To get a personalized proposal for your business click Get Quote, below.